When you need to work on logging, conservation, exploration and other projects in the forest, you need an Argo XTV. 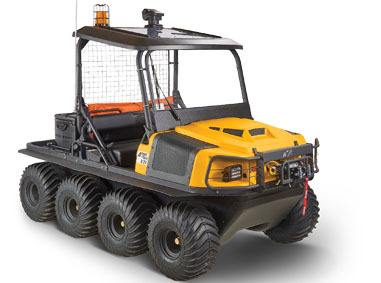 These vehicles can handle any terrain you encounter, and they can be configured in a variety of ways to move crews and tools between camps while protecting the environment and people at the site. Before you bring the heavy equipment in, you need roads. 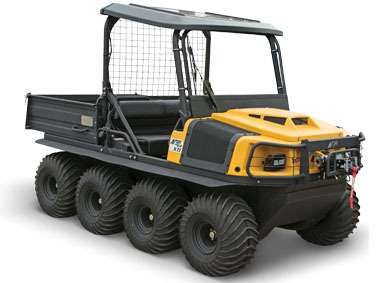 Since an Argo can travel over almost any surface, it can get your work crew into the forest for surveying and construction. It also works great in adverse weather conditions, letting you reach areas affected by mud, snow, ice, and flooding. Need to bring in tools? No matter the stage of development at the work site, an XTV can carry anything you need. These vehicles can handle loads up to 1,500 lbs. and tow up to 2,000 lbs. Models are available with dump beds and large cargo areas, while additional racks can be added to any model for more on-board storage. The Universal Mounting System lets you turn the back of your XTV into a mobile work station with tools and power supplies, while tool boxes can be configured for easy mounting, letting you bring in the set of tools you need for your current project. XTVs can be used to tow traditional trailers, or you can use one of Argo’s amphibious trailers. 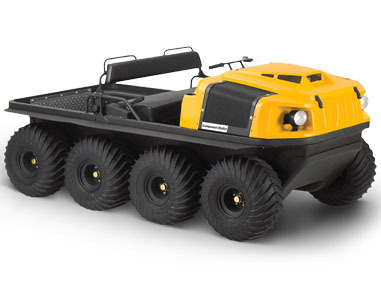 These have the same tire and hull design as an XTV, so they can go through water and over terrain just as easily. Need to work in environmentally-sensitive areas? The tires spread out the load, keeping ground pressure below that of a footstep, so you won’t damage the surfaces you drive on. This makes it ideal for wetlands, traveling between mud, water, and firm ground with ease while minimizing damage to the surrounding plants. The hull contains all the mechanical parts, so if there’s any leak, it stays in the vehicle instead of dripping onto the ground or into the surrounding water. What if something goes wrong on site? An XTV can be outfitted with a hose and tank to fight fires and it can carry a stretcher and other medical equipment, letting you quickly evacuate injured personnel. How well do these vehicles work? For Native Prairie Restorations, using an XTV to pull a broadcast seeder has greatly expanded their ability to plant prairie grasses. The XTV’s light ground pressure allows the seeder to be used in the winter, keeping the soil from being compacted and allowing work to be done when melting snow turns the surface into mud. When doing work near their Ann Arbor, Michigan, headquarters, this ability effectively triples the planting season they have to work with.